Cala Vinas holidays have wide appeal as the resorts benefit from their closeness to both the principle town, Palma, and the lively neighbour Magaluf. 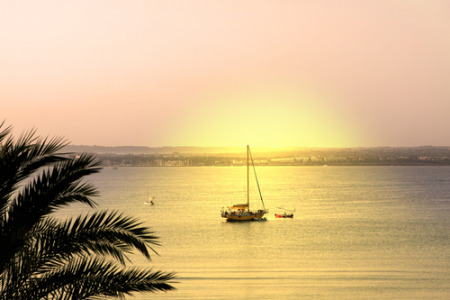 Located on the south west coast of Majorca, it lies in a deep inlet that gives shelter to its sandy beach. It is a a perfect spot for families and couples of all ages. It also appeals to those who want to relax by day and party through the night, as Magaluf is within walking distance. This proximity means that Cala Vinas visitors can make use of all their facilities. With low cost airlines flying from many regional airports and with a short flight time and quick transfers, you can breakfast in rainy Britain and bask in Majorcan sunshine over lunch. The season lasts from the end of April to the end of October with temperatures rising to the mid-thirties at the height of summer. If you are seeking a well-earned rest from the stresses of twenty-first century living, with a guarantee of sunshine, a sandy beach lapped by warm water, and a wealth of both sporting activities and tourist attractions, a cheap Cala Vinas holiday may be just the ticket. Attractions include Marine land, water parks, golf courses and the ever popular Golf Fantasia. A range of hotels and apartments provide high quality accommodation with tariffs to suit most budgets. Don't dismiss the Cala Vinas all-inclusive holidays as being too expensive. They can offer great value for money especially for families with ever hungry and thirsty offspring. Constant snacking can seriously damage your holiday budget, unless of course they are included in the price of your holiday. The many restaurants cater for all palates as they serve everything from traditional island fare to international cuisine. Although there are plenty of shops, the avid shopper should head for the capital Palma. Nightlife is low key but with Magaluf on the doorstep, this matters little. If a Cala Vinas holiday appeals but you find the thought of trawling through web page after web page looking for the best deal a little daunting, try our simple search facility. You'll find over three dozen travel companies, including leading brands, competing for your custom. It is simple to use, and remember, competition brings out the best bargains. Our search facility enables you to see, at a glance, the Cala vinas holiday that is the cheapest, and the one that offers the best value for money. It couldn't be easier. All you have to do to secure the holiday is make a phone call. As offers change daily, so in order to avoid disappointment, you should ring today.